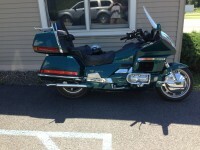 New to me 1999 GL1500 SE and no rear turn signals! 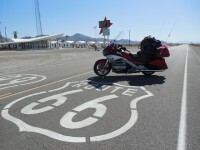 Just rode the bike home 850 miles from Watseka IL to Springfield, NJ. What a cold journey but can't think of a better way to get to know a new bike. Love the smoothness....hate the lights! They are just down right dangerous . An led flashilight would've been better so we're already going to address that. One other main issue is that the rear turn signals do not work at all. When I use either turn signal the indicators just flash quickly. The front turn signals work fine. The bike was serviced with a new rear tire and had the rear arm rests removed before delivery. Anything obvious to check? Can't imagine both bulbs being out but it wouldn't be the first time. 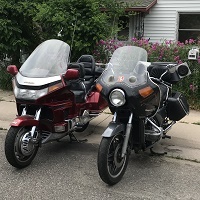 Re: New to me 1999 GL1500 SE and no rear turn signals! Congratulations on your new to you bike! I would first check to see if the bulbs are burned out. The fast flashing is an indicator of that. There is a little door on each corner of the top trunk to get access to them. If you have a test light or Volt meter, make sure you have power at the socket. I have had bulbs that look good, but are really burned out. The tester will let you know there is power at the socket. The bottom of the top trunk is held on by a few screws and also hooks into the bodywork. If the bulbs are fine, then I would go under the trunk and see where you are loosing power. Just a few things to start with. Awesome, thank you...should be easy peasy..
brrrr! That must have been one chilly ride! 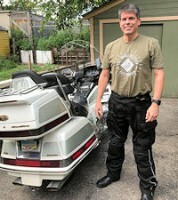 I did the same thing, flew to Chicago, picked up my 2000 SE, and rode it home (through 8 hours of POURING rain). One thing that others haven't suggested is a good hosing down - riding through the roads I know you took at this time of year, your bike is now coated in salt, which will be eating away at the frame and other parts. You will want to use plentiful amounts of water (not high pressure jets) to wash that salt out before it starts destroying the metal on your bike. Motorcycles are not typically treated for corrosion/salt protection the way cars are. I agree, the fast flashing normally indicates a burned-out bulb, so either the rear bulbs are burned out, or have become disconnected. Thanks for all the info! Love these model specific forums! Cleaning the bike after the ride was project number one. The salt build up was crazy and I have it mostly finished at this point but there are still a few spots that I will remove body panels and covers to get to and clean. One of the biggest issues on the ride home was not necessarily the cold weather but the lack of vision through the windscreen. I wanted more wind protection, the helmet buffeting was pretty intense even with the vent open, but if I had a taller windscreen, that would've been a real problem. Worst case, pull over at a garage and get a grinding wheel and cut the screen down to see over. What shocked me was the air burst from the back after a truck passed me on the single lane roads. WHOA!!! I've learned that this will probably be my last self inflicted winter ride unless the roads are clean and NO NIGHT riding on the GL until the lights are all replaced. I chased a bad bulb on my motorhome for several hours until I found the problem. The left brake light was out so I started troubleshooting: pulled the light housing off the back and the light started working. Put everything back together and as soon as I started driving the light quit. Did this a few times and I was about to start running new wires when I happened to look real close at the bulb: the filament was inserted into a fork-shaped holder, but was otherwise not secured. When the bulb was sitting horizontal gravity was enough to keep the filament connected, but any movement, or putting the bulb in a vertical position and the filament disconnected itself from its holder! So, even if the bulb looks good, they are cheap enough to just replace them anyway! update...taking the least path of resistance I replaced the bulbs. Still no turn signals. Not sure your familiarity with this beautiful machine so if my questions seem obvious or simplistic, I apologize in advance. The windshield does slide up and down a couple inches. Release the levers beside the mirrors. Are you sure the headlight bulbs are on? There are two smaller bulbs beside the headlight bulbs and a quick glance might give enough light to think the main bulbs are on when they are not. You can upgrade to better halogen bulbs but the standard H4 bulbs need adapters to fit your headlight, You can also upgrade to LED bulbs. Your headlight should be the clear plastic unit (earlier bikes had fluted glass). It's possible it has ozone degraded as some newer cars are prone to do. The person doing the rear tire may have inadvertently unplugged a harness at the back although that would probably affect other rear lights as well. The GL1500 is known for being hard on batteries. I wondering if the headlight issue and turn signal issues are related. It would be worth the time to check the battery connections and electrolyte level just for peace of mind. Does it start immediately or more like when you let go of the starter button? Take a voltage reading at the battery both off and engine running and a slightly high idle. Thank you for the reply. I did make a slight screen adjustment midway through the trip however the salt spray coming off the trucks was unavoidable so it was a moot point. I will adjust it again when the weather is more pleasant for riding. Headlight bulbs certainly do come on as well as the front turn signals, the marker lights, the corning lights, and the brake lights. This all leads me to believe that there is a disconnection in the wiring. LED lighting is must have for this bike, my 56 year old eyes need day makers! Interesting enough when the bike is cold, it takes a good five seconds of cranking to start. Once it's warm, starts right up. I will do some more searching tomorrow and post my results. I'm hoping that when I remove the trunk there will be a lonely connector hanging in the wind. I just started pulling side panels off to take a peak and clean. Nice thing is that every day I get to learn more and more about this bike and my punch list grows. I aim for reliability and function first, the style points come later. I installed a trailer hitch on mine, and for trailer lights added an Isolator box, it takes power straight from the battery and send it thru a small bank of relays which are triggered by the running/stop/turn signals mounted in the trunk, sending "Battery" power to the trailer instead of putting extra load on the bike's lighting circuits. It comes with a "plug-and-play" plug harness that connects to the light fixtures in the trunk. You unplug the bike's wire harness from the left and right stop/turn light fixtures and connect to the isolator's harness, then other plugs from the isolator harness go to the light fixtures in the trunk. Wiring and plugs accessible by removing four screws from the panel on the underside of the trunk. Careful removing the panel, little plastic tabs are fragile. The stop/turn lighting connectors are visible from the underside, but you can't really see them from the access inside the trunk where you change bulbs. When the Dealer removed the hitch, possible there was one of these isolator boxes installed, he removed it, and forgot to plug the bike's wiring harness back into the trunk fixtures? You'd know easy enough, there'd be no lights at all from the corner fixtures in the trunk (running or stoplights or turn signal). thanks DW, I will look for this today. I'm on a mission! Removed the lower trunk cover and in a jiffy found four connections just dangling. Two red connectors and two green connectors. I found a home for the red connectors, plugged them in and just like that we have turn signals! Now I need to figure out where the green connectors go to unless they were for the hitch. If you had left the hitch in place you would not have had the issue. I'm curious, why did you have the hitch removed? It's just like chrome, some love it, and some curse it. I understand. It is all personal preference. I don't tow a trailer much anymore either but I do use the hitch for a small travel trunk or a cooler rack. Comes in handy. If they are small two or three pin connectors they are likely for the side lights in the bottom of the trunk. An SE comes with the lights stock, Aspencade just reflectors but aftermarket lights can be installed. The Aspencade would still have the connectors in the harness, just unused unless aftermarket lights installed. You are a wealth of wing info! I'll take some pictures tomorrow and share the bikes ongoing transformation to a "Sport Edition". I'll start with a separate post on it's new life with me. Should be fun! So this weekend was an attempt to clean up the bike and get the road salt off as quick as possible. Most of the plastic comes off pretty darn easy and quickly which helps to expose the GL interior. Took most of the plastic inside for a good scrubbing and cleaning and to inspect for damages from the harsh ride home. I found a bunch of little cracks and scratches with a tab or two broken off along with a cracked screw hole. Nothing pressing or anything that would cause the bike not to function but never the less these items will get addressed. In addition, while the bike is somewhat a part, I will start replacing light bulbs and looking at ways to decrease the weight of the road barge. First off is those big old chrome wheel covers. Don't like them, don't need them. I also found a set of carbon fiber fork guards that were supposed to be for another bike, now long gone, that I will modify to fit the forks. It's my first attempt to "sportify" my wing. You should be able to sell the front wheel covers for a decent price. I'm sure they are well sought after by some, especially if they are in good shape. That looks like a beautiful machine.